Jackfruit pulp could be processed into jackfruit concentrate in strips and puree forms. The former is used to flavor jackfruit bar, sweet potato candy, and tart; while the latter is used to flavor jackfruit leather and pastillas. The dehydrated jackfruit is a nutritious snack item from ripe jackfruit pulp. It is golden yellow to golden orange and has a chewy texture with a sweet and sour taste. It is safer than the other dried fruit products because it is free from sulfite preservatives, which may trigger allergic reactions in some consumers. It is the only sulfite- free dried jackfruit product in the market. The vacuum fried jackfruit is a nutritious snack item from ripe jackfruit pulp that is yellow to golden brown. It is sweet and crunchy. It is processed at low temperature (below 100oC) under vacuum thereby maintaining its sensory and nutritional qualities. It has no added sugar and preservatives . It is the only vacuum fried jackfruit product in the market that uses ripe pulp. 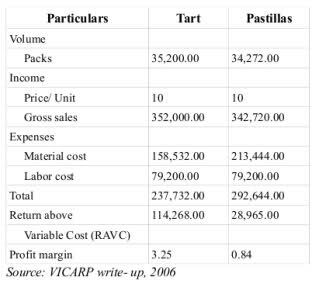 The processing of jackfruit tart and jackfruit-flavored pastillas is a technology developed for small and large- scale processors. The processes are simple and do not need sophisticated machines and food ingredients. 1.) Slice open the ripe jackfruits and take out the pulp by separating the seeds and the rags. 2.) Cook 60 kg of the pulp in 60 L sugar syrup (30 kg sugar + 30 L water) until the pulp turns soft to touch. 3.) Let cool to about 50oC and add 360 grams ascorbic acid and 360 grams citric acid. Mix thoroughly and and soak overnight in the sugar syrup. 4.) Rinse in running water for a few second and drain. 5.) Spread the drained pulp on drying trays lined with nylon mesh to prevent from sticking on aluminum trays. Dry at 70o – 75oC for 8 hours. 6.) Interchange drying trays every hour for uniform drying. Pack in 0.004 in. thick in polypropylene bags at 90 grams net weight. 7.Store the packed products in wooden screen cabinets in a cool dry place. 2.) Blanch 20 kg of the pulp in boiling water until the pulp turns soft to touch (67 kg of fresh jackfruit will yield around 20 kg pulp). 3.) Let the blanched jackfruit to cool. Then pack in polypropylene bag and freeze. 4.) The following day, take out the frozen jackfruit pulp. Deep fry in frying chamber. The vacuum pump will be turned on to reach the required vacuum of 25 inch Hg or higher. The frying operation per batch is 2.5 hours at 90oC. 5.) Place the fried product inside a clean sackcloth and centrifuge for 7 minutes. After centrifuging, allow to cool and pack in 0.004 inch thick polypropylene bags at 50 g net weight. One batch could yield 120 bags. Store the packed products in wooden screen cabinets in a cool dry place. Stir flour. Add sugar and margarine. Mix until margarine is broken into fine particles. Sprinkle with water and gather mixture to form a dough. Roll out to about 1mm thick and cut with cutter. Shape into tart shell. Bake half cooked. Fill shell with filling mixture and bake. Mix jackfruit puree and condensed milk. Cook in low fire stirring constantly until light brown. 2.) Cook in a low fire stirring constantly until about to thicken. 3.) Combine jackfruit puree and powdered milk and continue cooking until it does not stick to the pan. 4.) Knead in a chopping board with a rolling pin. 5.) Cool and wrap individually in cellophane sheets. great work.good for food research. Who are you know sale machine dry jack fruit chip. Jackfruit is my favorite fruit and in our country where I living is a main food. For that reason whatever and whatever can be make by this fruit I really like this concept. Thanks mate.